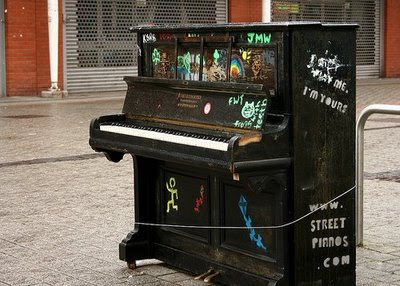 Continuing on from yesterday's FREE stuff theme, I've just read about a really great concept called Street Piano which involves pianos being left around various cities for anyone to play. In their latest venture, Street Piano are delivering 30 pianos to the streets of London as part of Sing London and the City of London Festival 2009. The pianos are going to be scattered around the capital in parks, train stations, street markets and they are there for ANYONE to play and it's FREE. Here's a map of London with the locations of the pianos clearly marked out. They even encourage you to decorate and personalise your piano! "...the pianos are also aimed to provoke people into engaging, activating and claiming ownership of their urban landscape. The pianos have also levered many hidden musicians from out of the woodwork. It has become apparent that there are hundreds of pianists out there who don’t have access to a piano to play. This project is about providing access to musical instruments, promoting creativity and creating music in public." The pianos will be in place during June until July 13th, after which time they’ll be donated to local schools and community groups. I love the whole idea and I'm so looking forward to locating a piano and entertaining the locals with my scratchy grade 1 scales, poor locals.